It's Boston. The year is 1959. The cast of a new musical is rehearsing in preparation to take their show to New York. But on opening night, the leading lady is murdered. This is the plot of Canby High School Theater's new production, "Curtains." After the murder, Boston Police Detective Frank Cioffi, played by CHS student Jonah Schiewe, steps in and quarantines the whole cast, crew and audience while he conducts his investigation into what happened while simultaneously insisting on continuing rehearsals with the remaining cast. Of course, others go down in the meantime. "Motives abound everywhere with people, and so he's got to get to the bottom of it," said Director Craig Holbrook. Holbrook describes the who-dunnit musical comedy as having "layers." It's a show within a show. "It asks our actors to play the actor they're playing and then the character the actor is playing," Holbrook said. "So it's a lot of fun." 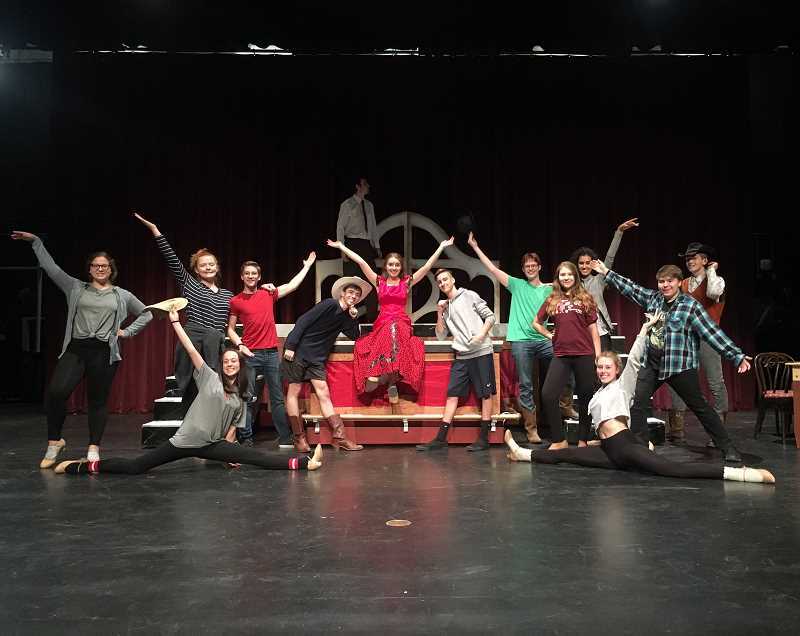 Along with Director Holbrook, other members of the crew are Musical Director Becky Stager, Choreographer Maddie Brockman and Costumers Chris Keady and Kim Villemyer. Holbrook, Stager, Brockman and Keady are all CHS alumni. "So you've got alumni in there working with the program, and I think that's kind of fun," Holbrook said. The cast is of course made up of current Canby High students. The leads are Schiewe as Detective Frank Cioffi, Tatum Pierson as Niki Harris, Cadence Moore as Georgia Hendricks, Ben Wing as Georgia's ex Aaron Fox, Susan Nash as show producer Carmen Bernstein, Josiah Keen as show financier Oscar Shapiro, and Aiden Rockwood as the British director of the show Christopher Belling. 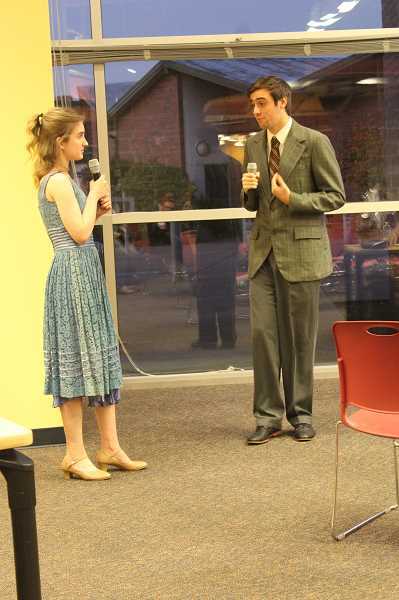 Other principals include Zander Laitinen as Sidney Bernstein, Jessica Beaver as Jessica Cranshaw, Emi Gunnarson as Bambi Bernét, Lee Hepler as Daryl Grady, Laela Wood as Joanie Harmon, Sean Sheveland as Bobby Pepper, Matthew Lennon as Randy Dexter, Jason McKeon as Harv Fremont, and Drew Pierson as Detective O'Farrel. "I am most excited about working with the kids and getting them to be better actors," Holbrook said, "just watching them grow as performers and pushing and challenging them to do more." Canby High School Theater is using the more appropriate school edition of the musical, rather than the Broadway edition. Holbrook noted that the show still does contain some violence, including an onstage shooting murder, which may not be appropriate for younger audience members. He recommends the show for persons age 10 and up. The show debuts at Richard R. Brown Fine Arts Center in Canby on Thursday, Nov. 1, continues on Friday and Saturday, Nov. 2-3, and then round two happens Thursday, Friday and Saturday, Nov. 8-10. All shows are at 7 p.m.
Tickets are $12 for general admission, $5 for children 10 and under and free for students and staff with school identification. "I just really, really, really want people to come see it," Holbrook said. "I think they're going to be very proud of the kids and they're going to have a good time."